Other Pretty in Pink posts: April Wonky Stars, May Nine Patches With Crosses, June Wonky Log Cabins, July Tic Tac Toe, August Log Cabins, September Strings, Oh, For Crying Out Loud, I’m All Caught Up!, January Bee Blocks. I’m excited for my month in the Pretty in Pink bee, especially since February is my birthday month. I’m finally cutting into my Shade Garden fat quarters by Michelle Engel Bencsko (a fellow Jerseyan). I’ve asked bee members to make me two blocks, one modern and traditional, between 6.5″ and 9.5″. 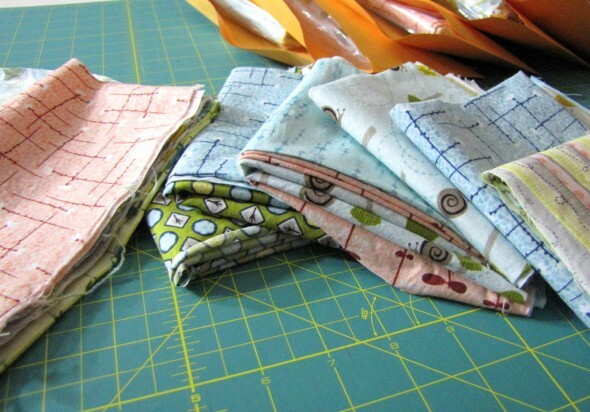 I don’t care what kind of block they make, but I definitely want to put together a sampler using these fabrics. I didn’t include any solids, so I’m excited to see what gets made. I’m a little nervous about whether I sent enough fabric to everyone (2 long, wide strips and 2 big fat squares), but I think in the end it will be fine. And I gave each member of the bee a fat quarter from the Pretty Bird collection by Pillow & Maxfield as a present. More stash busting!